How do children develop cognition? Let us start with a couple of facts: 1. A child’s development is holistic; 2. All of a child’s developmental components are interrelated. But where do science, math, engineering, and content-based topics fall within cognitive development? To start off with mums, you can take full credit for your child’s genetic make-up but keep in mind that a lot of your child’s cognitive skills are learned. So you play a significant role in your child’s cognitive development. Cognitive skill development for your child means learning skills such as attention, memory and thinking. These can all be strengthened and improved with the appropriate modeling and support you provide for such learned skills which will eventually lead to your child’s ability to evaluate, analyse, compare, problem solve, and understand cause and effect. So before getting all excited that your child can identify numbers and letters, knows shapes and such, understand their cognitive development with the depth that it deserves to be understood. It’s not the age at which your child identifies letters and numbers that would deem your child a genius. It is more about focusing on supporting your child’s holistic cognitive skill development early on, because at the end of the day, it is far more important and sustainable to understand the world through all those learned cognitive skills, rather than identifying letters, colours or shapes. Let us look at some examples of how you can naturally nurture your child’s cognitive development by ensuring that the important skills are being learned. Your little Thinker: Take a simple book reading opportunity. You and your child are sitting together and reading a story that is a mix of words with illustrations, or just a picture book. Your child starts pointing to words or images. This is the perfect time for you to help build your child’s cognition such as learning to focus and think. Read together, point out things that may not appear to be too obvious and draw your child’s attention to those details, ask questions, and acknowledge your child’s attempts to understand and make sense of what they see. Describe and be specific about what you are talking about to help build their vocabulary. Have your child look for additional clues and observe them while they make those connections verbally or simply by pointing. Your little Explorer: Playtime is a great time to explore. While your child can simply be left alone to play while you take some time off, your participation in your child’s play is in fact crucial. You place some large blocks or books in front of your child hoping that s/he will pick something up and start playing. They will pick it up but only for a short time – after which time they may put it down and show disinterest and be disengaged. Your participation allows for maintained interest and the provided support to explore. 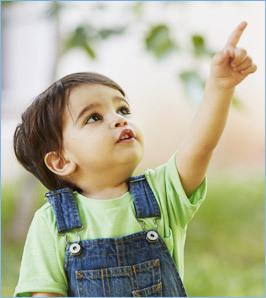 Through your communication with your child, showing, pointing, gesturing, your child is more encouraged to explore. Make it open-ended. Allow your child to explore in all the ways they can imagine. And remember, there isn’t only one function for each toy or object. Allow your child to show you all the possibilities. Your incredible Leader: Your child is always looking to develop a sense of self, skills and competencies. It’s your child’s first day of school. They are timid. They need to be close to you –they are holding on to you telling you not to go. What is your role in all this is…? The positive reinforcement and motivation you provide for your child as they manoeuvre around within a social world. You have to be very cautious – realize your own child’s competencies and types of support they need to survive in this particular and strange situation – do not compare them to others and say, “look, everyone else is playing.” Don’t force them, or push them. Give them the time they need. Let your child lead in his/her own way by problem-solving and you follow that lead. Your child is a unique individual; as are all children – but if they are expected to be like others, then they are no longer unique and they will no longer have the confidence to lead. Build in them confidence, and persistence, and watch them lead. Your Curious child: Children have developing minds. What they don’t know, they want to learn. That is the world of your child. What happens if I touch this? Why is a shoe called a shoe? Listen to them carefully because the fact that your child is asking questions explicitly or behaves in ways in pursuit to satisfy their curiosity are clear signs of developing cognition. Have you ever had your child ask you how they came about? How they were born? This is one of the many tough questions your child will ask. And it is their right to know. Don’t feed the child with misconceptions about birth. You don’t need to answer directly – because let’s face it, it is a complicated concept to teach a preschooler – but you have to challenge yourself to address their curiosity. Ask questions to understand their understanding. How do you think you were born? Let their responses guide your answers. But by no means shame them for asking. Do not disregard their question. Each stage of your child’s development is a different stage of understanding and of making sense. So take this opportunity as a core-learning trajectory (for both of you) to support their increasingly sophisticated levels of thinking. Give them opportunity to think, to make connections, to understand cause and effect and to continue asking questions. This is true cognition. By the way, did you realise that we didn’t even mention math or science… Makes you wonder huh?